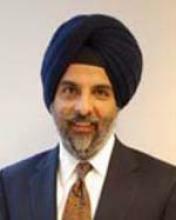 Department of Otolaryngology > Faculty > Gurpreet Ahuja, M.D. Gurpreet Ahuja, M.D., is a board certified otolaryngologist and a fellowship trained pediatric otolaryngologist. He is the CHOC Children’s Specialists Division Chief of Otolaryngology. Dr. Ahuja attended medical school at the All India Institute of Medical Sciences, New Delhi and completed his residency in Otolaryngology/Head and Neck Surgery at the Manhattan Eye, Ear, and Throat Hospital, New York, followed by a fellowship in Pediatric Otolaryngology at the Children’s National Medical Center in Washington, DC. Dr. Ahuja is board certified in Otolaryngology/Head and Neck Surgery, a Clinical Professor of Otolaryngology at the University of California-Irvine, and is Director of Pediatric Otolaryngology training for UCI’s residency program in Otolaryngology. He is particularly interested in pediatric airway reconstruction, pediatric sinus surgery, childhood hearing loss and congenital head and neck disorders. Dr. Ahuja currently serves as President of the Medical Staff at the CHOC Children’s Hospital (CHOC).